From the crew who brought you Back 2 the 90s featuring Technotronic, Berlin Reunion and Pure Oldsckool. From the big favourites everyone knows to the forgotten gems you hardly ever hear these days. Put on your best 80s fashions and hit the dancefloor with your favourite 80s dance tracks. Our special guest for the event is DJ Maynard. Maynard, formerly known as Maynard F# Crabbes, is an Australian entertainer, television presenter and radio announcer. He was a key figure in bringing the ABC's youth-oriented radio station Triple J to national prominence, and he worked at ABC radio and as a video presenter for many years. Head along to http://maynard.com.au/ to get the latest news on what he's been up to. 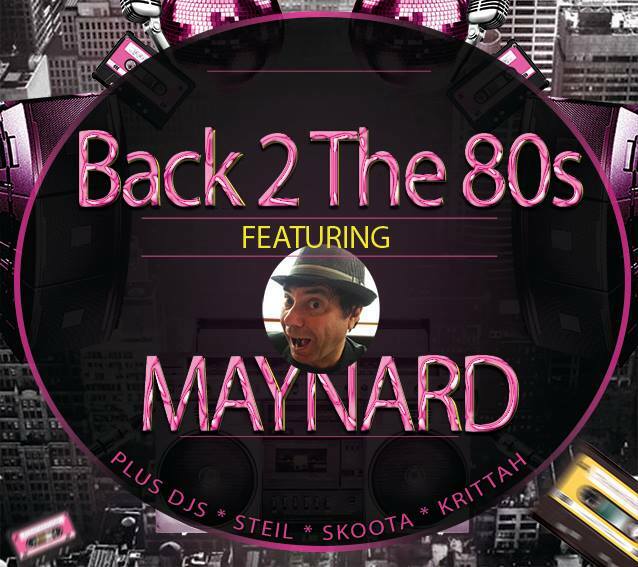 Maynard will be supported by local DJs Steil, Skoota and Krittah - all spinning a selection of classic 80s mixes and 12" singles.